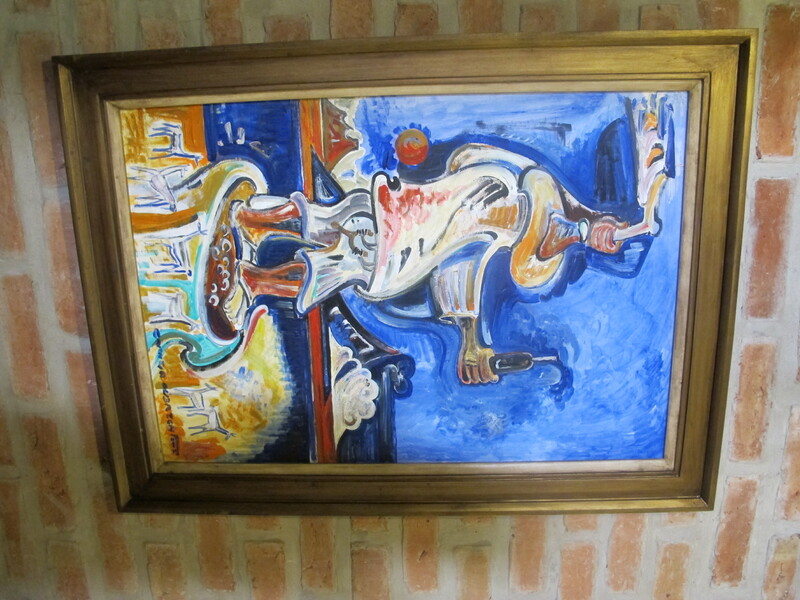 Price: Medium to high (La Brigada is “the” steak house, that any local will send you to if you have only one day in Buenos Aires so its fame allows it to price higher). Atmosphere: Authentic, traditional and has a rustic gaucho feel. The restaurant’s wooden walls are lavishly decorated with anything that is Argentine. From the local football teams’ flags to the pictures of celebrities who dined at La Brigada over decades of its legendary stardom. Dress code is not very strict although I would not run in straight from a training in sneakers and sweatpants. Wear jeans or a dress, but not too formal so you don’t feel like a Martian on the planet Earth. Food: Generous, authentic and top quality. Starting with the crispy empanadas – either filled with beef, ham and cheese or a vegetarian version with corn cream – we knew that this place has an insider knowledge of authentic Argentine cuisine since the turnovers were crisp yet fresh because of their succulent stuffings. A bit more “exotic” appetizer is a lamb tongue or a pork feet or why not to relish the beef testes savored with vinaigrette?? If you do not want to risk then go for Sopresatta sausage, Grilled Red Sweet Peppers or the superb Grilled Provolone cheese as we did and loved them all. When you move to main courses, the your choice is not made much easier as the selection is wide. Kidneys, tripe, sweetbreads, steak, just name any part of an animal body – including the tail – are on the menu. All of them are of a great quality and cooked to a precision. Ideally find a group of like-minded friends and share a number of the cuts, slices and chunks of superb meat and inner organs (for some of you it may sound a bit “Middle-aged”) so you can find your favorites. After all each of us has a different boundaries in terms of food we can eat so with a plate of everything one can stick to them like a bee on a candy or extend the boundaries beyond one’s savage imagination and eat something inconceivable to date. There are some salads too, but if you are a vegetarian I would advise to skip this restaurant with a kangaroo jump otherwise you might suffer a dietary shock. The salads are a refreshing companion to the meats although the french fries are crisp and generous inviting you to be slightly more naughty. At La Brigada the desserts are not overlooked. Choose from ice-creams, melting chocolate cakes to fresh fruit for those of you who ordered too much meat before peaking on the sweet delicacies menu. The selection is better than at most cafès, patisseries and sweet shops. If you are a fan of the local sweet, gooey, condensed milk-based thick liquid called “dulce de leche” (translated as “the sweet from milk”) then the Dulce de Leche Pancake is the one to go for. I personally fell in love with the Chocolate Vulcano. I have to warn you before though as this cocoa bomb blast is insanely addictive and can turn many of you into chocoholics, which I must admit I am. Drinks: With a flank of meat a sumptuous and big wine is a choice of many wine drinkers. The wine needs to have enough strength to put up with the fat and intense flavors of the meat. Fruity and “corpsy” (big-bodied) Argentinian Malbec is excellent with any red meat. We went for a D.V. Catena Malbec-Malbec 2010 from Bodega Catena Zapata, which was exquisite. Complex with red fruits, touch of wood from barrel aging and concluding with an invigorating, long finish. The wine list at La Brigada is exuberant in South American wines so you do not need to limit yourself on Malbec, white and sweet wines from Chile and Argentina feature on the ‘Carta de Vinos’ as well. Address: Estados Unidos 465 , San Telmo neighborhood, Buenos Aires, Buenos Aires Province, Argentina. 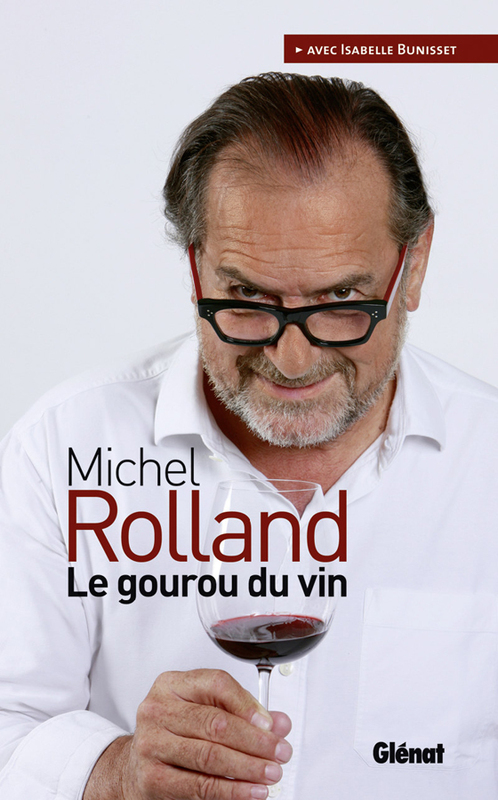 Michel Rolland is perhaps the most famous wine consultant on the world. Serious wine drinkers know him for his creations in Bordeaux, Spain, South Africa, South America and I can go on and on until I cover most of the world. A native of France (Bordeaux), he embraced globalisation, packed his suitcase and went to discover the world of wine across the globe many decades ago. I wrote about his involvement in a unique wine project in Argentina’s Uco Valley at Clos de los Siete as well as a more boutique Yacochuya near Cafayate in the North. For many he is a controversial personality (Jonathan Nossiter’s movie Mondovino, which will be screened during the London’s real Wine Fair in its full version, hurt Mr Rolland’s reputation painfully) for other he is a wine genius knowing exactly what wine drinkers want and bringing it to them. As a guest of Wine and Business Club of Monte-Carlo I was invited to a very interesting gastronomic evening with food prepared by the Hotel de Paris’ executive chef Franck Cerutti and wines “cooked” by the legend of French wine making Michel Rolland. Wine and Business Club is a members’ club spanning into four French-speaking European countries (France, Belgium, Switzerland – Geneva and Monaco). 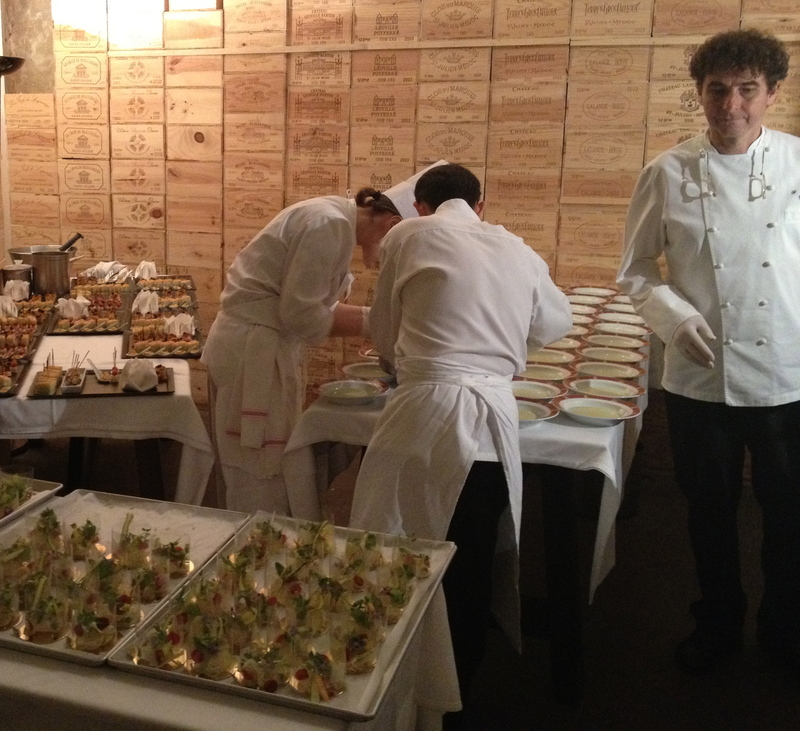 Since 1991, the Club organises wine dinners at various locations, mostly at gastronomic restaurants such as at Hotel Le Bristol and Shangri-La in Paris. The evenings are not just about wine and food though, There are various guest speakers talking about business-related topics from wine to environment. Today, the club boosts with 2.500 members so it is a great opportunity to discuss various topics with like-minded people. The special guest at the event held in the cellar at Hotel de Paris hotel in Monte-Carlo I have attended recently, was Michel Rolland himself. The famous wine consultant came to present his new book “Le Gourou du vin”, The Wine Guru, whose English translation we might see this summer. I have got the book in French and currently I am working on it. With my basic knowledge of French it is a tough nut, yet it is motivating to learn about Mr Rolland’s thoughts about most of the wine-producing countries around the world, his personal journey and encounter with other wine gurus such as Robert Parker as well as less pleasant experiences such as being according to him misrepresented by the already mentioned film director Jonathan Nossiter in his movie Mondovino. For me it is an ideal first book in French to read since it is easier to read about the subject of my passion – wine. Although, I did not understand much of the talking (in French), I know I will catch up once I read the book. Important was that the food was excellent, the wine very interesting and the location was extraordinary. The success of the food has to be granted to the Chef Franck Cerutti, the guardian of the Three – Michelin star restaurant Luis XV at Hotel de Paris, the wine journey around the world to Michel Rolland and his “Rolland Collection” and location right next to the cellar of Hotel de Paris was just perfect for an evening dedicated to wine and food. The first course Royale d’asperges vertes, primeurs à cru truffés was accompanied by an intensely floral Sauvignon Blanc, Mariflor, 2011 from Argentina’s Mendoza region. The delicate, creamy asparagus cream with vegetables and truffle touch was interesting with such an intense Sauvignon Blanc. 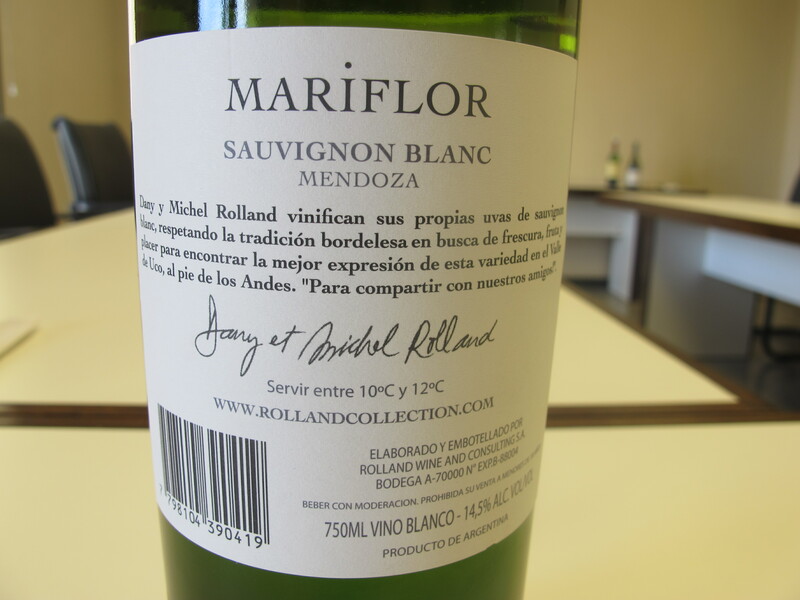 Named after Michel Rolland’s daughter and its flowery aroma – Mariflor, had hints of white peach petals, elderflower and high acidity on the palate cutting through the creamy nature of the velloutè. If you like it intense, you will love this wine. Rolland pointed out: “I am a ‘terroirist’ (not a terrorist)”, hinting at the Argentina’s unique terroir for Sauvignon Blanc giving it its typical intensity. Second wine poured was my favorite from all. 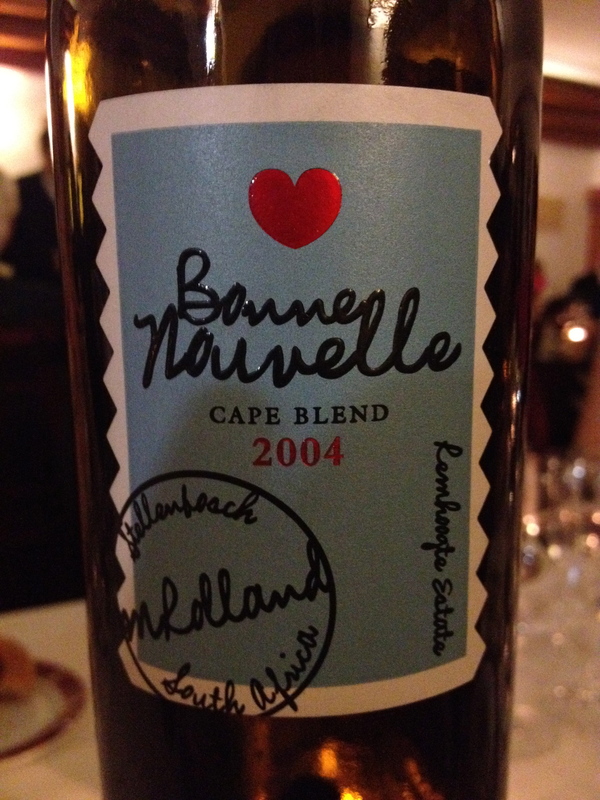 The Bonne Nouvelle from South African Stellenbosh, 2004 vintage struck me at first as a Bordeaux. I thought, that it was the Chateau Fontenil from Fronsac served next to it, yet it was the other way round. The Fronsac red was flat, a bit stewed and with just fine acidity. On the other hand the South African blend of Merlot, Cabernet Sauvignon and locally typical Pinotage aged for 12-15 months in French barriques (50% new) was concentrated playful wine where spices, dark fruits and poppy-seed vibrantly jogged over the palate (acidity). They were long runners, indeed, as the prolonged finish was still quite intense, making the race even more interesting. These two wines were followed by a Risotto aux petits pois et lard paysan. A delicious meal with lard adding a bit fatness to a delicate sweat pea risotto, needed for the big-bodied wines. 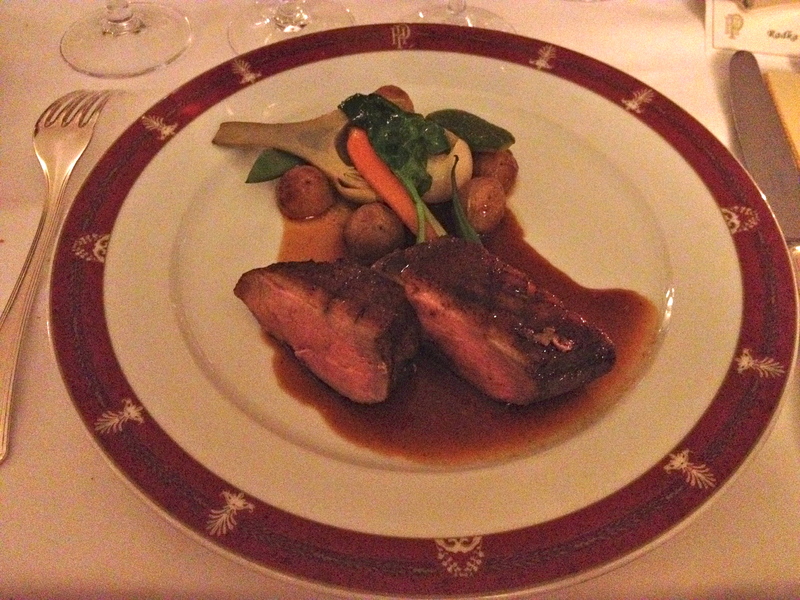 Moving to Spain and France with wines, the next course Magret de canard en “dolce forte”, primeurs et pommes de terre nouvelles, Duck with young potatoes, artichokes, carrots, mangetout and leeks in “dolce forte” sauce, was masterfully paired with the wines. The wines served with our third course were Campo Eliseo, 2005, from Spanish Toro region, which Rolland called suitably ‘extrovert’ and one of the children of his home region Pomerol – Château Le Bon Pasteur, whose vintage (2000) we were supposed to guess in order to win something in a following raffle. The Spanish wine was 100% Tinta de Toro (local name for Tempranillo). Juicy, bursting with fruit from black currant, blackberry through cassis and dark cherry, this was an exemplary wine for a duck dish, and my second favorite after the Stellenbosch darling. Château Bon Pasteur is the property of Michel Rolland’s family from his grand farther’s times. A vibrant wine, indeed. Red fruits mingle with black forest fruits and acidity with concentration at the same time add to this swirl of flavors. Again the vehemence of the wine added even more juice to the duck. On its own though, it is not my type of wine – a glass maybe, but two or three would be too much. The biggest surprise of the evening was the following food and wine pairing – Malbec, Val de Flores, 2005 from Argentina with a creamy dessert Fraisier, crème légère à la vanille and sorbet fraise. Full-bodied, woody and slightly peppery, yet balanced, Malbec with Vanilla scented cream and strawberry sorbet went surprisingly well together. But, who would expect such a match? I love surprises, especially the positive ones and ending a gourmet evening in this fashion was the best I could wish. 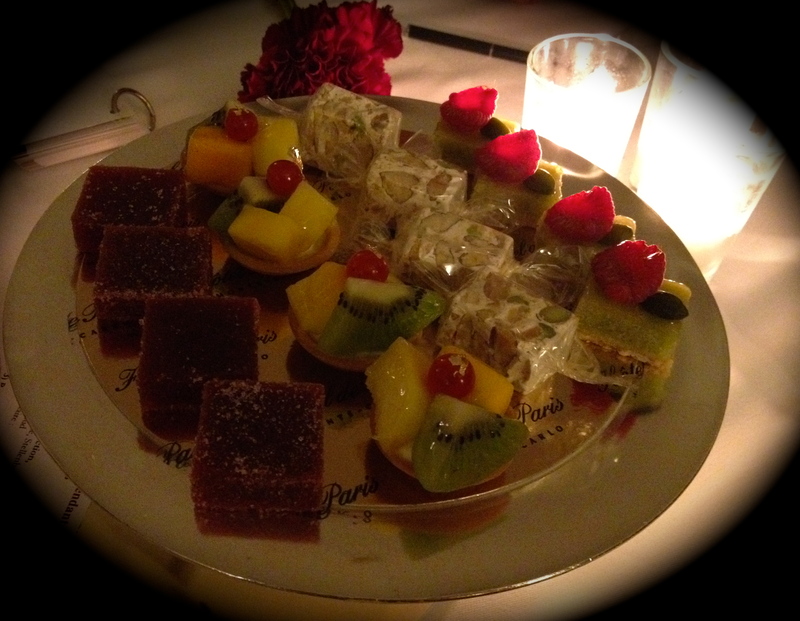 Although, the petits fours – small sweets served with coffee at the ultimate finish of the dinner – were so good that they almost overshadowed the previous dessert. These are though better with tea or coffee and not with wine as they are too sugary to overwhelm the palate so any wine would taste like water with them and that would be a shame when one gets to drink such an interesting range of wines as the Rolland Collection. 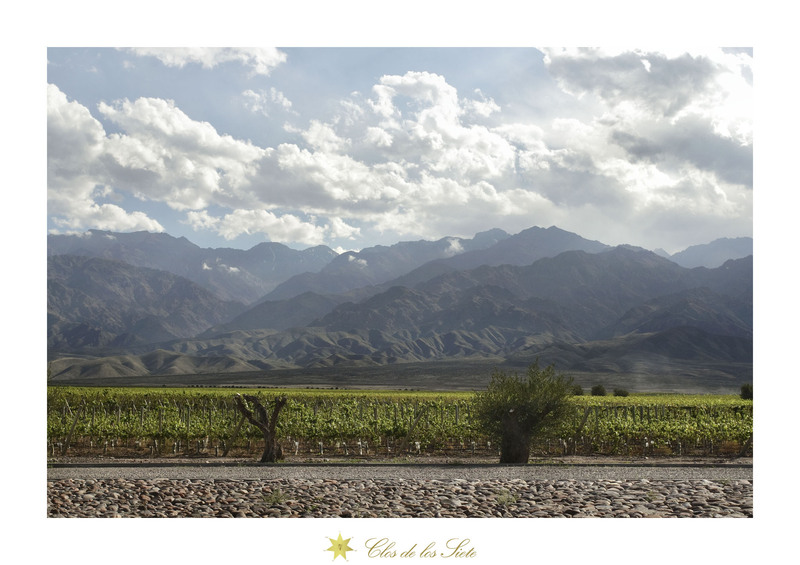 Clos de Los Siete is about 20 minutes drive from Tunuyan, a town South of Mendoza in Argentina. Reaching to the foothills of the Andes the extensive property is spread through the cool Uco Valley, the increasingly-praised region of the Argentine wine industry. In latin America, the more South one goes, the cooler it is. Therefore, South Uco Valley is much colder than anything else up North in Mendoza. 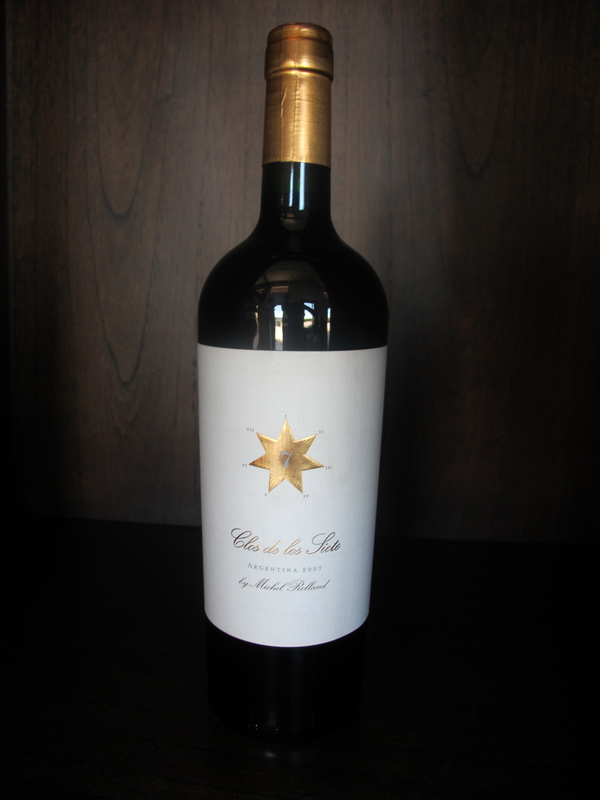 Clos de Los Siete is a unique project of seven French wine proprietors mostly from Bordeaux. It encompasses five different wineries in one enclosed area in an Argentina’s Southern Uco Valley. 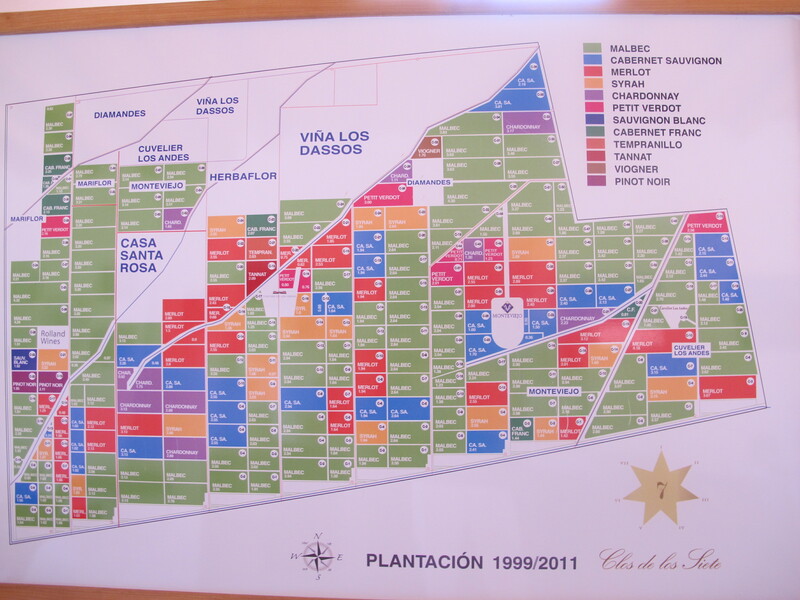 Together there are about 850 hectares planted with vines. Explaining the project in a detail is a knotty endeavor, so I would leave its complexities to the visitors. Seeing it with one’s own eyes and mainly experiencing it is the best, and perhaps the only way, to understand it. I will share with you the most eye and mind-striking impressions my visit imprinted on my wine-obsessed persona. Below, is a map with parcels divided by grape varietal. The Bonnie family of Château Malartic – Lagraviere in Bordeaux and Château Gazin Rocquencourt in Pessac – Léognan. Bodega Diamandes is their part of Clos de los Siete. Jean Guy y Bertrand Cuvelier, the patrons of Château Léoville – Poyferré (second growth from St. Julien) and the Château Le Crock in Bordeaux. 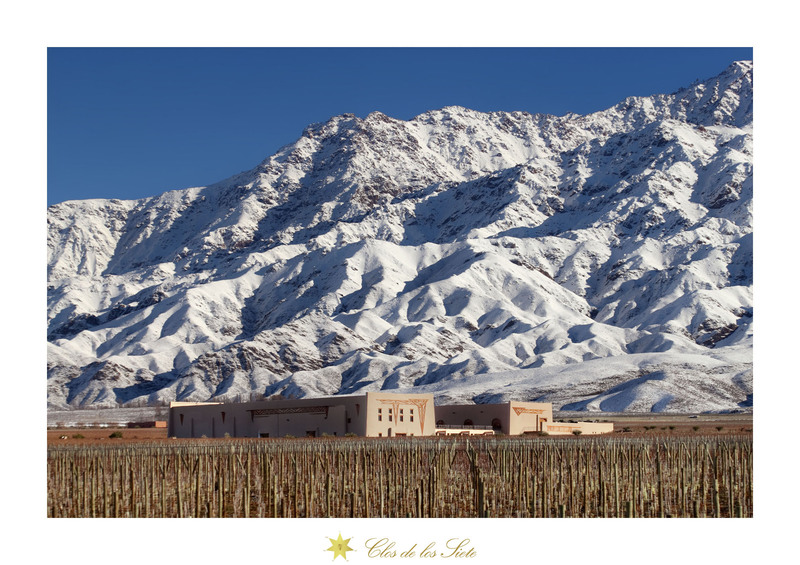 Cuvelier los Andes is their stake at Clos de los 7. Baron Benjamin de Rothschild and Laurent Dassault of the Bordeaux’ Château Clarke in Listrac and Château Dassault in Saint-Emilion. Flechas de los Andes is their Argentine dream. Catherine Péré-Vergé, from 1985 the owner of the Château Montviel, Château La Graviére, Château Le Gay and Château La Violette in Pomerol. Monteviejo is her property at the Clos. The man behind the cooperative project is one of the biggest personalities in the wine industry today, the French oenolog Michel Rolland. 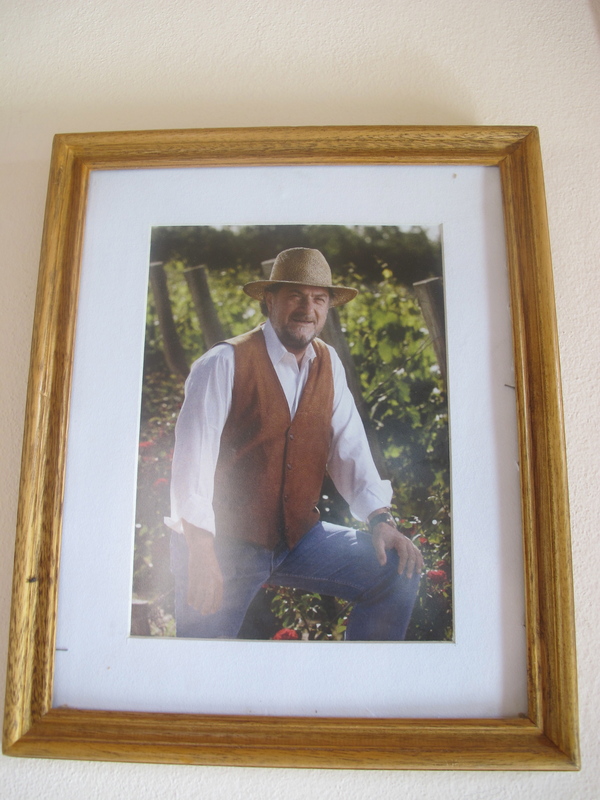 He and his wife Dany own one of the wineries at the Clos de Los 7 and he is the consultant for all of the rest. On top of that, each year he selects grapes and varietals from all the plots at the property and creates the red blend called Clos de los Siete. 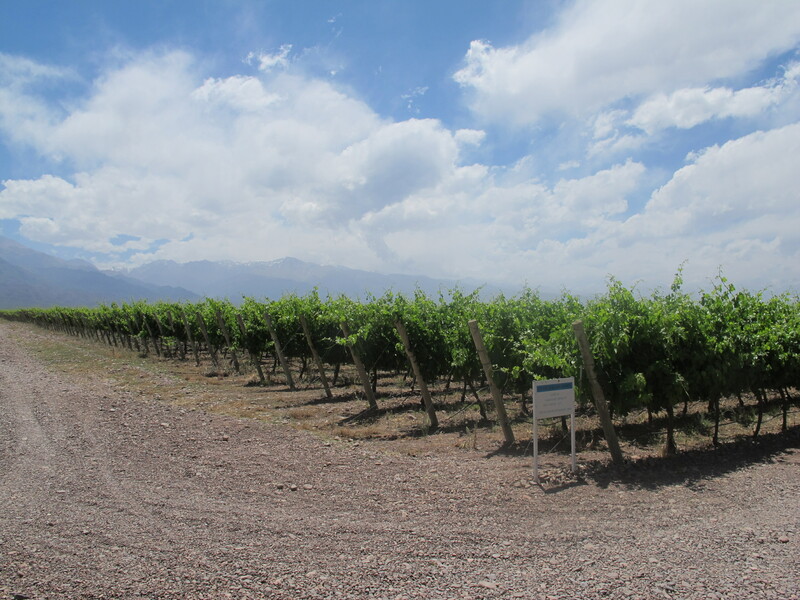 It can be based on Malbec, the dominant grape in terms of planting area at the property, but he can decide for more Cabernet Sauvignon in some years as well. Syrah and Petit Verdot usually complete this French grapes-based blend. The system is driven by terroir as the meticulous dissections of the land into distinct plots disclose. As I wrote earlier, Malbec is prevailing, but Cabernet Sauvignon, Cabernet Franc, Syrah, Petit Verdot, Pinot Noir, Tannat and Tempranillo complete the range of red grape varietals. Planting of Pinot Noir in a desert-like climate may rise one’s eyebrows, but it is the baby of Michel Rolland on his part of the property. Located in a higher altitude than most of the other plots, the cooling wind and lower temperature on that spot made it possible. It tastes similarly to some of my favorite Pinot Noirs from the Czech Republic. In the older wine at the beginning the nose is a bit closed, but later on, the typical strawberry aroma develops. On the palate its tannins are fresh in youth, acidity zesty and red fruit juicy. It is not a bargain though. For US$ 75 for the 2008 vintage, the Czech version leads on value with the pricier Pinots selling for $30 in retail price. Competing with a burgundy is rather a different story. There is some complexity, but perhaps the vines (plants) need more age as they will develop their roots more, to struggle more down thought the soil. The resulting wine then should fascinate one’s palate more. The terroir is interesting enough. With the prevailing sandy, clay and pebbles rich soil, it is suitable for intense sun heating the pebbles as well as it absorbs irrigated water well. 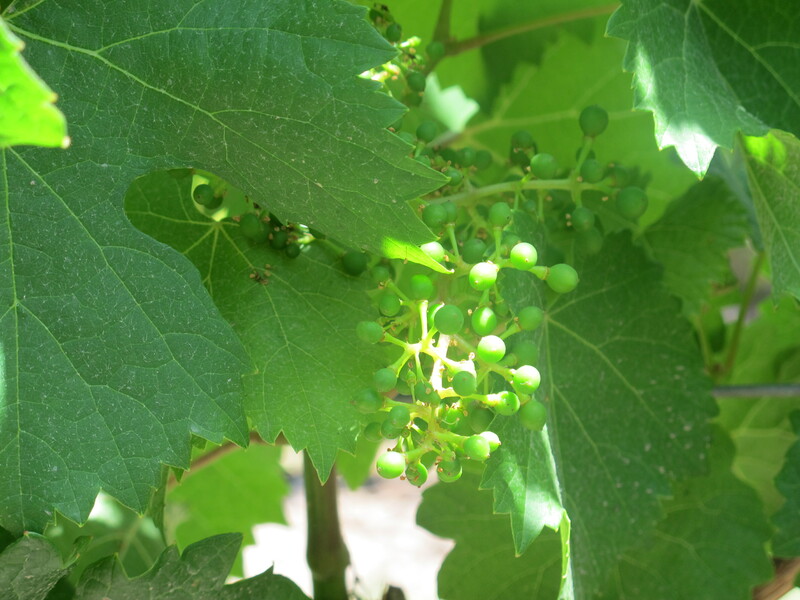 The extremely dry climate makes irrigation necessary and the way it is used influences the resulting taste of the grapes. In the case of Michel Roland’s preference for concentrated wines it has to managed carefully to avoid dilution of the juice in the grapes. Drip irrigation is popular in the better wineries of Argentina and this high-end property is not the exception. The altitude in the highest point is 200 metres more than in the lowest spot in 1.200 metres above the sea level. Which is much higher than in the mostly flat Bordeaux near to the Atlantic ocean. A very different experience for the mostly Bordeaux-born owners of the land at Clos de Los 7. Tannat and Tempranillo have been planted only for experimental purposes so far. The coming years will show whether there is any potential for these two varieties. 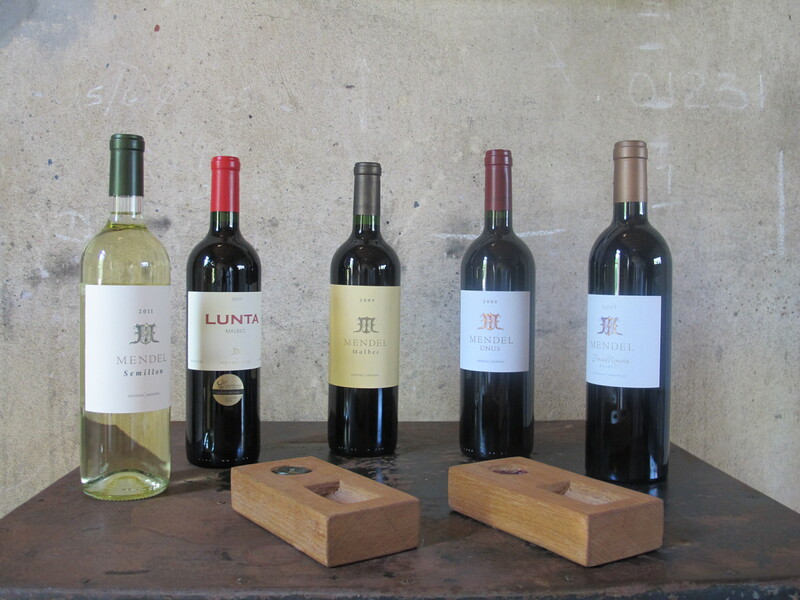 Tannat has proved its potential in Cafayate with a large number of local wineries planting it. Up there in the far North, it gives lush, fruity wines with sweet tannins so different from the French wines made from this varietal. 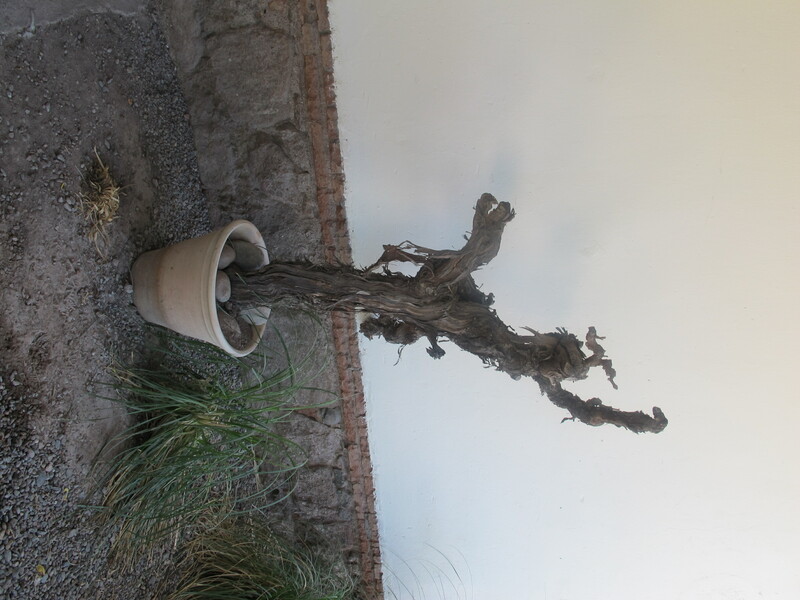 Growing Tempranillo in Argentina flashed through my mind already in Cafayate. Seeing the similarities between the climate there and in Ribera del Duero where the desert-like nature and wide differences between the day and night temperatures, necessity of irrigation (Ribera has an exception in EU), the high altitude – these all resemble the mountainous parts of Cafayate and in some extent also the Uco Valley. There are also some white grape varietals. Michel Rolland makes an intensely vegetal Sauvignon Blanc with a zesty lemon aroma and fresh acidity reminding me of a New Zealand Sauvignon style. He calls the wine Mariflor. The entire Rolland’s range here is: Mariflor Sauvignon Blanc, Mariflor Pinot Noir, Mariflor Malbec, Mariflor Camille and Val de Flores. The site is unique, there is nothing alike in Argentina, and perhaps in all world. This European cooperative style of joining vineyards and benefitting from them together, as is in the case of the Clos de los Siete annual blend by Michel Rolland, is already showing a great potential for the future of this recently born project. Yet, as with all great wines, patience is the holy grail of making the most complex and appealing wines in the world. Therefore, both the proprietors and the drinkers shall embrace the challenge and try the property’s wines over and over in the years to come. As you drive from Tucuman to Cafayate the lush green fertile hills with flora resembling my native Central Europe turn into an almost life-less dessert with the rising altitude. The land gets drier, rocky and all you can see are giant cacti some more than 200 years old. Colorful rocks with hues if red, brown and grey add a bit of artsy atmosphere into an otherwise plain surface. From hill to hill you can spot some wild horses, cows, goats and sheep feeding themselves with everything green they can spot on the occasional pastures. They look so piecefull, harmless and content that one wishes to join them in their worry-free lives. In this setting one would rarely expect seing vines, what more the vines giving lush and complex wines. Yet, the reality is different than it might seem. If Michel Rolland, the world’s most famous oenologist and consultant, trusted such climate and took on the challenge to assist on creating spectacular wine here, then something must be right. More than right, indeed. 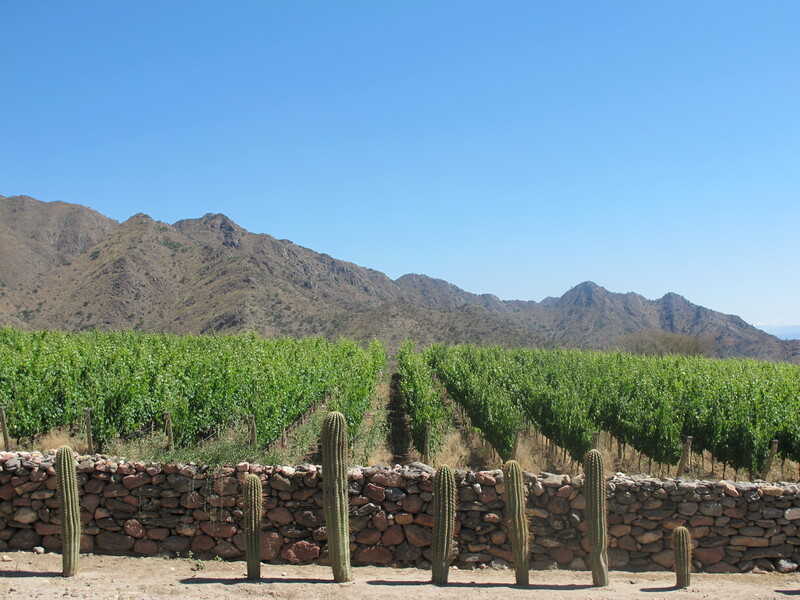 It is the altitude and big temperature difference between the cool nights and hot days that make growing of top-quality vines around Cafayate possible. Most of the best winemakers in the region believe in Cab.Sauvignon and think of Malbec as more suitable for Mendoza. Not Michel Rolland and his old friend and Alvaro Etchart, the primary owner of the estate Yacochuya. The old Malbec is the key to success to his intriguing and concentrated wines. The main winemaker at the winery today is Alvaro Etchart’s son Marcos, while Michel Rolland remains consulting for the estate. 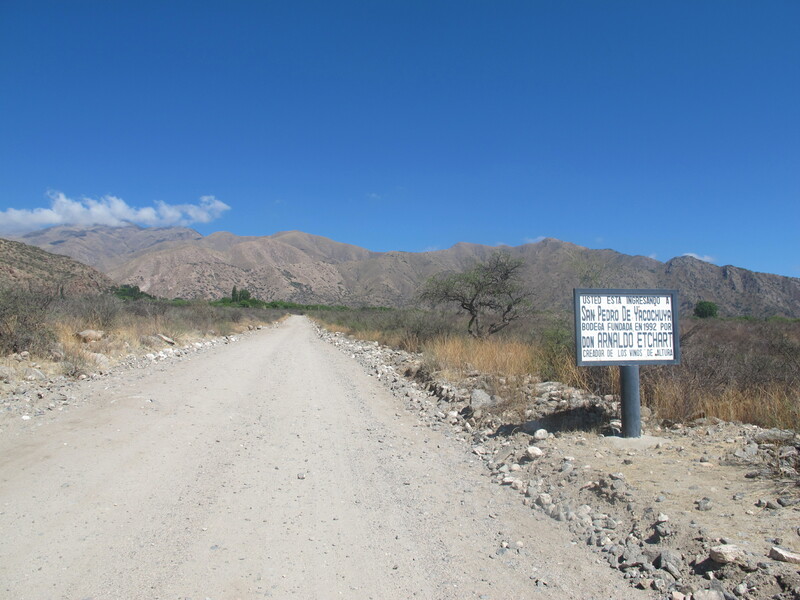 Getting to San Pedro de Yacochuya becomes an unforgettable trip if you cycle or walk there, even for cars it is quite a bumpy ride. Once you leave the main road, pass through an alley of trees pampering you with shade, you get to even a dustier and more rocky road. Going slowly higher up, the pungent rays of the sun during summer days require increasing willpower to continue on the seemingly short journey to San Pedro de Yacochuya off the main well-tended road. The winery is located only five kilometres from the main road, but the gradually worsening conditions as you accent towards the winery (2035m above the sea level) make the trip challenging. Beware of the dust, especially when a car passes by as it stirs the suffocating mass of dust and may cause a difficulty in breathing. When it happened to my sister I thought she might die on the spot. She could not breath, we had no water to clean her sinuses and mouth so the only solution was to stop and wait until her breathing got back to normal. Passing a school we thought: “hurrah we are there”, but, to our slight disappointment and surprise at the same time, we had to continue further. Who would think of a school here? Quite far from the town. Nevertheless, later we have learned that it is quite usual in the area. Arrival to the Yacochuya winery was an ultimate reward for our physical as well as psychological effort. Stunning views from a tranquil patio by the winery’s visitors entrance calmed down our pumping hearts and exhausted minds. Marcos Etchart, the winemaker welcomed us and took straight to the premisses where tanks filled with this year’s wine were awaiting us to sooth our thirst and fill our minds with joy. After a short explanation about the family winery, it’s history, relationship of his father Alvaro Etchart with the legendary French oenolog Michel Rolland, and the techniques employed in wine growing and wine making as a result of his consultancy, we moved to tasting. We tasted various wines from the tanks and later the barrels. Yacochuya produces a small quantity of aromatic Torrontes, in 2011 also a deeply coloured rosé from Malbec, unoaked and oaked Malbec, Cabernet Sauvignon and in some years also a locally popular Tannat. Using French oak is the rule of thumb, the length of ageing and also the age of the barrels varies according to the quality level of the resulting wine. The highest range of wine is aged for 18-24 months in the new French barrels. All the wines are extremely concentrated, with soft tannins and enormous depth. The most interesting for me and my sister (a sommelier) was the spicy Cabernet Sauvignon. Red pepper and dark berries on the nose with hints of leather from the wood and big, concentrated yet balanced with approachable soft tannins. It is like a birthday cake for adults. Dark berries add the sweet feel, the alcohol (above 15%), the festive atmosphere. During our visit, Don Alvaro Etchart was not around, which was a bit shame since his love of poetry and connections in the local wine trade are profound. The family house is just above the winery and it’s perhaps the view or the waterfall on the property that inspires him to seek the beauty of life in poetry. 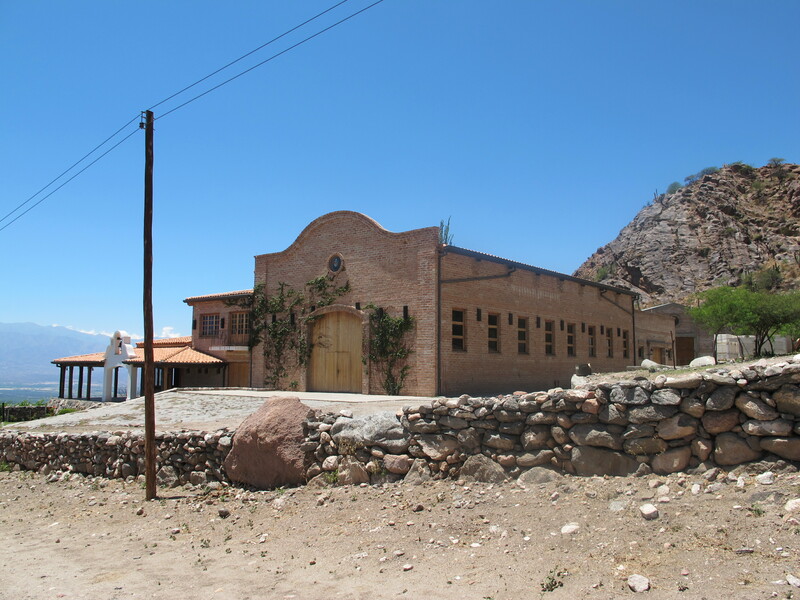 Surely, meeting him and tasting the tremendous wines at the San Pedro de Yacochuya winery near Cafayate is a good reason for my return to the region. I missed the poetry, but not the art hanging all over the tasting room. This particular one was for my personal appetite for art the most appealing. An energetic, youthfully slim and stylish Anabelle Silecki, co-owner of Bodega Mendel in Lujan de Cuyo met us in Mendoza at our hotel’s reception hall and took us to the winery by car. I was advised before my trip to ask locally based people to pick me up since it is challenging for foreigners to drive around. The signs are often very confusing so one can get lost easily. Ms Silecki had just flown into the town from Buenos Aires for a number of meetings so she stayed at our hotel as well. The Park Hyatt in Mendoza is the most popular hotel for anyone from the wine industry to stay in. Perhaps it is because of it’s magnificent wine bar. 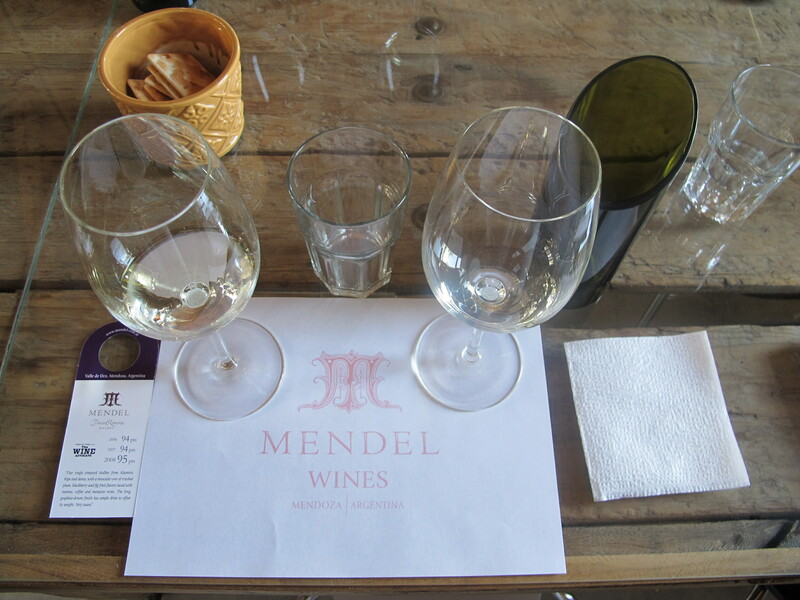 The Mendel winery she owns in partnership with her talented winemaker Roberto de La Mota had a soothing effect on our European palates as it was the tiniest winery we have seen so far not only in Mendoza but also in neighbouring Chile. Set in an old simple building with a traditional character this unpretentious bodega is unpretentiously charming. There are rows of vines planted around the winery, mostly Malbec, some olive trees, roses and less locally common vine varietals such as Mugrón to show visitors. 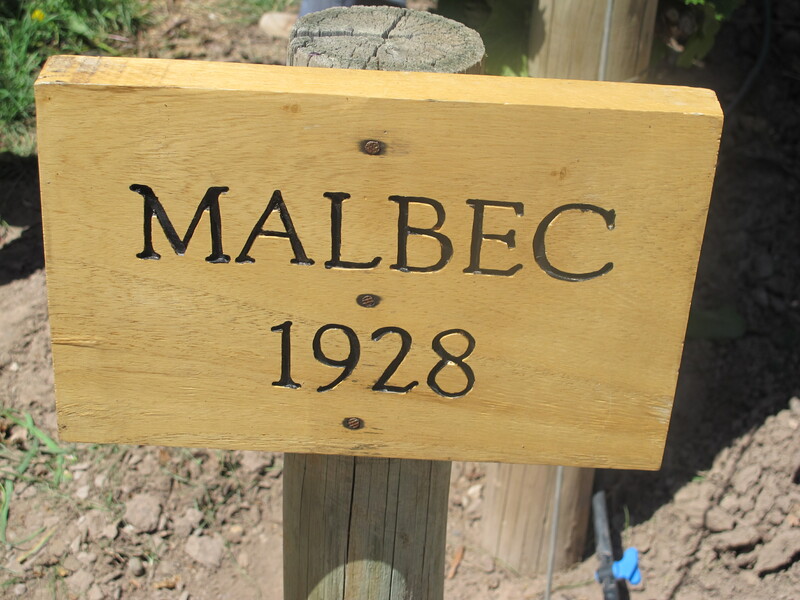 The oldest Malbec was planted in 1928 meaning that these plants are over 80 years old. Mendel has also other vineyards, all spreead across the vast region. 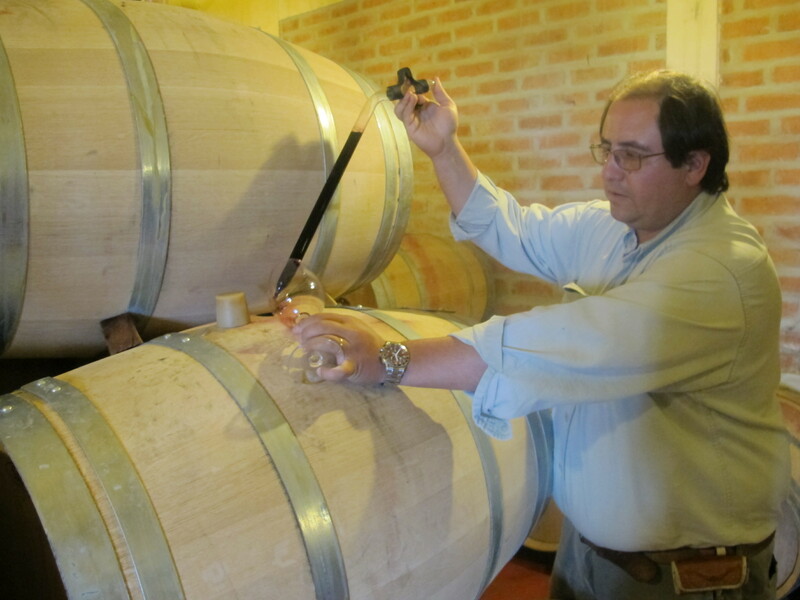 Most of the winemaking is done by hand and both Roberto De La Mota, one of the most respected winemakers in Argentina, and the winery’s second winemaker Santiago Mayorga are not afraid of experiments. Recently they have planted some Semillion and Petit Verdot with aim to explore the potential of these varietals in the Mendel’s vineyards. 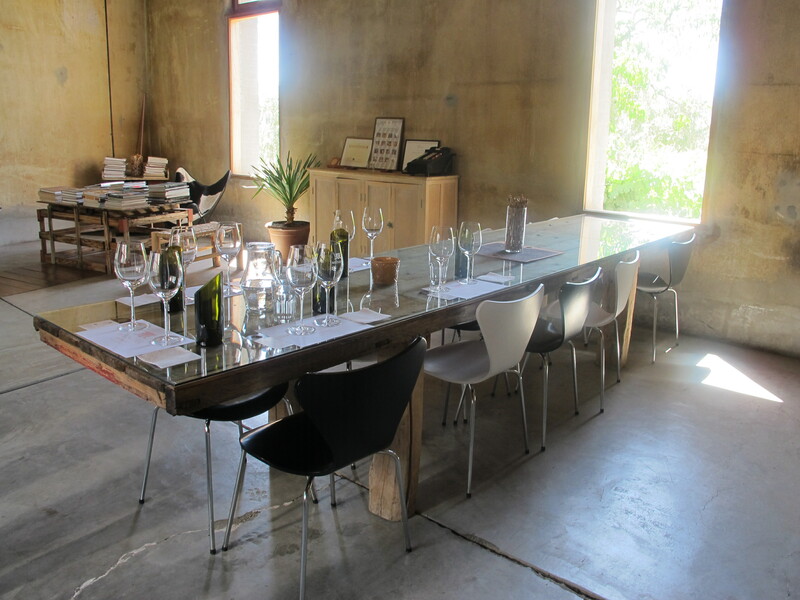 In a fresh, eclectic, yet rustic tasting room we have tasted the white Semillion, a common partner in sweet wines. This time though in it’s fresh, zesty and aromatic coat in a dry single varietal wine. It was excellent! Disappointing though was Ms Silecki’s assurance that there are no bottles left for sales, that is how popular this wine is. Moving to reds our palates were more than compensated for not having the opportunity to buy one bottle and take it with us. The fresh and fruit driven Malbec and to a similar extent fruit – faithful Cabernet Sauvignon were delicious. There, the stereotypical difference between the New and Old world approach to winemaking was tangible. Many of the New World wineries let the fruit speak and the oak is dormant. Of course, it differs from winery to winery. I am open to both approaches and in the case of the Mendel’s wines I was grateful for some exuberant fruit in my glass. The Argentines are magnificent hosts so if some, like Ms Silecki did apologise for offering us only a small and simple lunch, then you will eat like a king by most of people’s standards. In a minute, we savoured the crispy, freshly baked beef meat filled empanadas, perfect with the fruity Malbec. The empanadas are in Argentina typical dough turnovers filled with meat, cheese, onion, olives or other ingredients depending on the region. In Mendoza they are mostly beef and olives-based. But, you can find exceptions such as cheese and other vegetarian options such as filled with juicy onions as at Familia Zuccardi’s winery restaurant in Lujan. At Mendel we were further treated to a delicious homemade olive oil with fresh bread, the oil having a wonderful vegetal notes on the palate. Later came a plate of rice with grilled vegetables and, a fresh mixed salad, which is also the part of almost every meal with an exception of a breakfast. Pan (bread) with dulce de leche sweet spread arriving to Argentina with the Spanish immigrants is a typical morning meal.